ŠKODA is expanding its in-demand Yeti Monte Carlo range with the addition of two new engines. 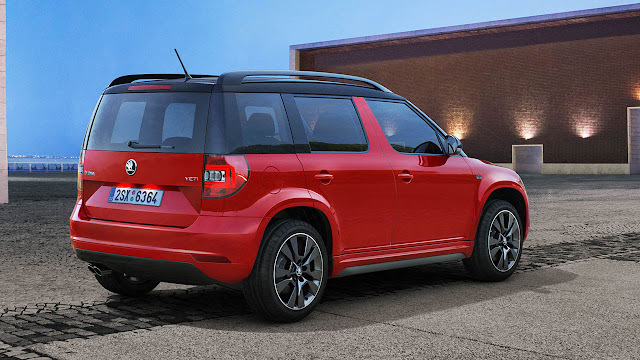 Following its introduction to the Yeti line-up last year, the sporty Monte Carlo variant has proved extremely popular with buyers – prompting ŠKODA to offer an even broader and more affordable range for 2016. Originally available with a 2.0 TDI 150PS diesel, the Yeti Monte Carlo range now features a 1.2 TSI 110PS petrol and 2.0 TDI 110PS diesel – with the former offered with an optional seven-speed DSG gearbox. The arrival of the two new engine options has the added advantage of making the Yeti Monte Carlo an even more affordable proposition, with the 1.2 TSI 110PS model starting at just £19,700 OTR. Adding the DSG automatic gearbox increases the price to £20,800 OTR while the new 2.0 TDI 110PS diesel is priced at £21,045 OTR. All three new models are front-wheel drive and come with generous specification lists and a striking design package. This consists of 17-inch Origami alloy wheels finished in gloss black, Bi-Xenon headlamps with cornering function and dynamic angle control, black roof and door mirrors and black spoilers at the front and rear. In addition, all versions feature a black front grille, Monte Carlo badging and LED rear lights. Inside, standard equipment includes a three-spoke Supersport leather multifunction steering wheel, sports seats with Monte Carlo upholstery and Monte Carlo floor mats, instrument cluster and door sill trims. The new models are available to order now, and join an already established line-up of Monte Carlo models that are available on the Citigo and Fabia ranges. Inspired by ŠKODA’s rich sporting history, the badge first appeared in 1937 on the Popular Sport Monte Carlo Coupe – a special edition model built to celebrate the brand’s success in the 1936 Monte Carlo Rally. The badge was re-introduced to the range in 2011 on the Fabia Monte Carlo.